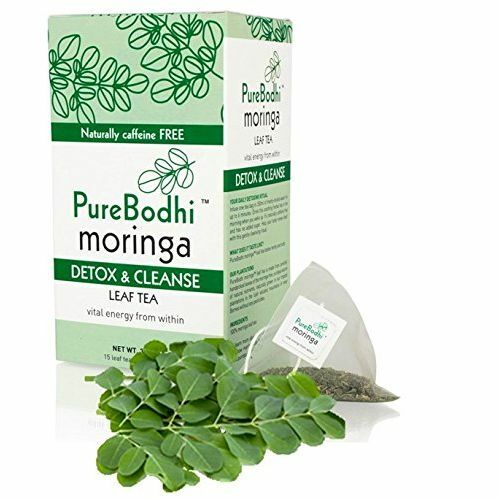 Moringa leaf tea by PureBodhi Moringa - 100% pure Moringa Oleifera infusion - Cleanse and Detox. Caffeine free. No added sugar. Moringa Oleifera, also known as the "miracle tree" because of its high nutritional content is a plant native to the Himalayas. Its leaves are rich in vitamins, proteins and minerals with antioxidant, anti-inflammatory, detoxifying, purifying and metabolism balancing properties, promoting a faster elimination of toxins from the body. PureBodhi Moringa Detox & Cleanse tea is made with selected handpicked with fresh leaves grown naturally without chemicals or additives in the lush mountains of Borneo. Usage: Infuse one tea bag in freshly-boiled water for up to 6 minutes. Drink this soothing herbal tea daily when you wake up, ideally 20/30 minutes before breakfast.